Reviews installation, data types & administration, functions, location queries and other common tasks you perform when using PostGIS. PostGIS is a free, open source spatial extender for the PostgreSQL open source database. Spatial extenders leverage existing database capabilities to handle geographical and image data. Common applications include proximity analysis for addressing questions of how far something is, geocoding for finding latitude and longitude of addresses, and web mapping for supplying data to various map servers. PostGIS has features equal to, and often exceeding, popular commercial offerings such as Oracle Spatial and SQL Server. Like Oracle, it offers 2D and 3D support for geometry. PostGIS geography type mimics what you’ll find in SQL Server. This Refcard provides a quick reference for common tasks you perform when using PostGIS. We based our examples on PostgreSQL 9.1+ and PostGIS 2.1. For a thorough treatment of PostGIS, we encourage you to buy PostGIS In Action, 2nd Edition and to chomp the PostGIS manuals at http://postgis.net/documentation. This Refcard assumes that you are reasonably familiar with PostgreSQL and have more or less heard of basic concepts required to work with geographical and image data. No experience with PostGIS is assumed. 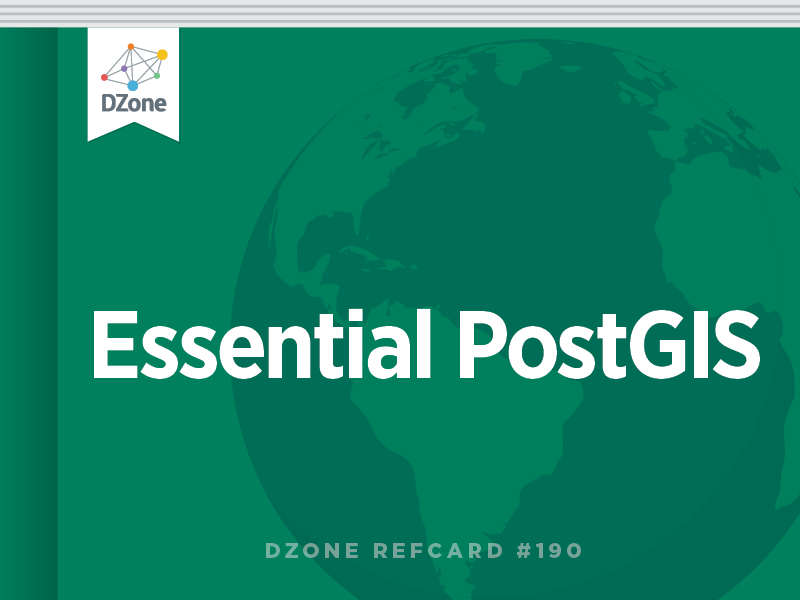 For more on PostgreSQL, check out our Essential PostgreSQL Refcard (http:// refcardz.dzone.com/refcardz/essential-postgresql). To find installer packages for most operating systems, visit http://postgis. net/install. To compile from source, visit http://postgis.net/source. Make sure you already have a working PostgreSQL server. Geometry - Planar vector type. Fewer functions available and slower than geometry, especially when computation encompasses large areas. Raster - Pixel-based, multi-band type similar to common image types. Numerous statistical and processing functions. PostGIS places no limits on the number of bands that a raster can have. The pixel type of each band can also vary. Rasters, in addition to analysis, are useful for general image manipulation such as resizing, conversion between different formats. Most useful to enforce consistency of edits and for simplification, ensuring connected edges still remain connected. Geomval Geomval is a compound type that arises when you intersect a geometry with a raster - for example, if you overlay a polygon or linestring atop a single-band raster. The raster neatly partitions your geometry into smaller geometries along pixel values. So for a linestring you may end up with a point or multilinestring cut where elevations change along the space. The combination of the geometry and the value forms a geomval. shp2pgsql is a command-line tool for importing ESRI shape files. Use it with psql. Shp2pgsql generates a SQL script that you then execute to perform the import itself. -s srid_from [:srid_to] srid_from is the spatial reference system of the incoming data). Omitting srid_to will load the data without transformation. -g Specify name of the target geometry or geography column. If omitted, column names default to geom. and geog. -G Imports data in as geography type. Source SRID must be 4326 or you must transform to 4326 with --s.
-I Create a 2D spatial index. If omitted, shp2pgsql addes no index. -N NULL geometries handling policy (insert, skip, abort). raster2pgsql is a command-line tool for importing raster data. Supports many formats of raster data depending on GDAL library. -s srid_from srid_from is the spatial reference system of the incoming data. -F Create a filename field in new raster table. Useful if loading a folder of rasters where you need to cross-reference back to file. Geometry, geography, and raster data types often share the same function, but not always. You can usually intuit which functions apply or don’t apply to a specific data type. For instance, you’d never try to count the number of bands against a geometry type. Not all functions require parameters of the same data type. For instance, to see if a point lies within a raster, you’d pass a geometry type and a raster type to the ST_Intersects function. PostGIS offers close to a thousand functions, each with multiple overloads, but mastering only about a dozen or so for each data type will suffice. We cover the most commonly used functions below along with the most typical arguments. To explore the ever growing set of functions, visit http:// postgis.net. ST_DWithin(X, Y, D) Returns true if two objects are within a specified distance (D) of each other. X, Y spatial types can be geometry, geography or raster. X and Y must be of same spatial type. All inputs should have the same spatial reference, which will dictate the unit of measurement for the distance parameter. In case of geography D should be noted in meters. Returns true if two objects share space. X, Y can be geometry, geography or raster. ST_Intersection(X, Y) Returns the spatially shared object or empty. Only available for geometry, geography, and raster. The raster version of the function that goes by the same name will return a new raster that is the intersection of another raster (nodata vals), or a set of geomvals that is the intersection of raster/geometry. If X is raster and Y is geometry, output is raster. If X is geometry and Y is raster, output is set of geomvals. If X is geometry and Y is geometry output is a geometry. X && Y Operator returns true if the bounding boxes of two objects intersect. X, Y can be geometry, geography, raster, or topogeometry. X <-> Y Returns distance between the bounding box centroid of one fixed against others using indexed near neighbor search. Use this operator in the ORDER BY clause to utilize geometry only index. X <#> Y Returns distance between the bounding boxes of one fixed geometry against others using indexed near neighbor search. Use this operator in the ORDER BY clause to utilize geometry only index. ST_Transform(X, SRID) Reprojects a raster or a geometry from one spatial reference system to another. X can be a raster or geometry and SRID must be one found in the spatial_ref_sys table. ST_SetSRID(X,SRID) Sets the spatial reference system of a geometry or raster to a known SRID (found in spatial_ref_sys). Unlike ST_Transform, this just sets the SRID meta data and does not change the coordinates. ST_AsText, ST_AsGML, ST_AsGeoJSON, ST_AsKML, ST_AsSVG, ST_AsX3D Outputs a geometry or geography in textual, GML, GeoJSON, KML, SVG, X3D formats. ST_GeomFromText, ST_GeomFromGML, ST_GeomFromJSON, ST_GeomFromGML Converts representation in textual, GML, JSON, KML to geometry. NB: Replace Geom with Geog in function name for geography. ST_Point(X,Y) Create a geometry point from X, Y coordinates. For longitude, latitude (WGS 84), X corresponds to longitude and Y corresponds to latitude. ST_Buffer(X, D) Returns a geometry or geography that defines the area within distance D from X. Often used in conjunction with ST_DWithin to visualize the enclosed area. ST_Expand(geom.,num_ units) Returns a 2D geometry that is the bounding box rectangle of the geom expanding num_units in both directions. num_units is in units of the spatial reference system of the geometry. ST_X(aPoint), ST_Y(aPoint) For geometry points, returns the X and Y coordinates. If spatial reference is WGS 84 then ST_X returns longitude and ST_Y returns latitude. ST_Extent Aggregate function that returns bounding box of a set of geometries. ST_Union Aggregate function that returns spatial union from a set of geometries, effectively dissolving boundaries of overlapped regions. ST_ClosestPoint (only geometry) Returns closest point on one geometry to another. ST_Distance(X, Y) Returns minimum distance between X geometry and Y geometry. ST_MaxDistance(X, Y) Returns maximum straight line distance between X and Y. If X and Y are the same, this function finds and measures the farthest possible distance within the same geometry. ST_ShortestLine (X, Y) Outputs the shortest linestring between X and Y.
ST_LongestLine (X, Y) Outputs the longest linestring between X and Y.
ST_3DIntersects, ST_3DDistance, ST_3DLongestLine, ST_3DShortestLine 3D companions to aforementioned functions. ST_MakeLine Aggregate function that creates a linestring from geometric points. Use ORDER BY to control order of the points. ST_Equals(X,Y), ST_ OrderingEquals(X,Y) Returns true if geometries X and Y share the same 2D space. The ordering of vertices can be different and even represented by a different set of vertices. Similar related function is ST_OrderingEquals which tends to be faster, but requires directional order to be the same. ST_Clip(rast, aPolygon) Returns a new raster cropped by the boundary of the geometry, usually a polygon. ST_Value(rast, band, aPoint) Returns a pixel value on a specific band at a specific geometry point. ST_ DumpAsPolygons(rast, band_num, exclude_no_ data) Outputs a raster as a set of geomvals. Exclude_nodata is optional and defaults to true if not specified. LAST (Default if omitted) FIRST MEAN SUM COUNT RANGE Aggregate function works on rows of rasters, usually of the same dimension, band number, and value types. Output is a new raster.If you omit the band argument, union operation takes place across all bands in all rows. ST_Tile(rast, width, height, padwithnodata) This set-returning function chops up an input raster into smaller equally sized rasters. The padwithnodata argument is optional and defaults to false. When false, some resulting tiles may be smaller than others if the dimensions of your original raster cannot be evenly divisible by the width and height. ST_DumpValues(rast) Returns a band of a raster as a 2-dimensional array. If band is not specified, the function returns a table with each band taking up a row. The column names of the table are nband for the band number and valarray for the array. ST_SetValue(rast, nband ,X, Y, newvalue) Updates a pixel value at given band within a given geometry (usually a point). You may also explicitly specify the X and Y coordinate of the pixel. ST_ColorMap(rast, colormap) Creates 8BUI multiband raster from single band raster. Colormap takes on values such as "grayscale", "pseudocolor", or a colormap text string that defines mapping. Use this function to "colorize" your raster. ST_AsPNG , ST_AsTiff, ST_AsJPEG Outputs a raster in common formats. Mostly used for exporting outside the database to web pages or reporting tools. ST_AsGDALRaster(rast, format) Output a raster to other formats available via GDAL. To obtain list of available formats, use ST_GDALDrivers(). ST_FromGDALRaster(X) Convert from other raster formats to PostGIS format (from type is automatically inferred). CreateTopology(name, SRID) Creates a new database schema to house topology faces, edges, nodes, and relations. Returns the id of new topology created. DropTopology(name) Drops a topology schema with name name and all topogeometry columns within it. Geometry(topogeom) Casts a topogeometry to a geometry. Alternate syntax: topo::geometry. These are examples that showcase some PostGIS functions. Using indexed nearest neighbor bounding box centroid operator. Only approximate because the check is approximate because we’re treating the earth as planar instead of spherical. This example assumes our geometry is stored in WGS 84 long lat. Use indexed box operator <#> to find 100 closest roads by bounding box distance and then narrow down to true geometry proximity by doing a spherioidal distance check. For each road segment, find the 2 closest postals within 1000 meters of the road. If no postal within 1000 meters, then NULL is returned for postal_code. Rasters formed will be 1 band 8BUI value 1 (defaults when not specified) and pixel size will be the same and clipped to the extent of the dem rasters and return first. The spatial catalog tables provide an inventory of spatial columns you have in your database as well as additional properties about them often used by third-party tools and viewers. They are similar in concept to the standard information_schema.columns table of PostgreSQL proper. spatial_ref_sys Table that lists all spatial reference systems and proj4text projection information to convert between spatial reference systems. geometry_columns A view that lists all columns in your database that are of type geometry and what subclass of geometry they are, in addition to dimension, spatial reference. Pre-2.0 this was a table that required manual intervention. geography_columns A view that lists all columns that are of type geography. It is very similar to geometry_columns in structure. raster_columns * A view that lists all columns of type raster and key properties: spatial reference, number of bands, pixel types, extent of raster coverage for each. raster_overviews * A view that lists all tables and raster columns that serve as lower res versions of higher res raster columns. In addition, it lists the main raster table/column and the pyramid overview_factor. Raster over view tables are created when you use the -l option when loading. topology.topology * A table that lists all topology schemas in database, spatial reference system, and dimension of each. topology.layer * A table that lists all topogeometry columns and what topology they belong to. These are just a few of the most popular PostGIS extensions. PostgreSQL language extension that allows writing stored functions in R.
Key/value column type that allows storing and quering multiple ad-hoc key- values in a single field with very fast indexing support using PostgreSQL gist index. Comes packaged with all binary distributions of PostgreSQL. All spatial indexes use the PostgreSQL gist index type for indexing, but have a different operator class that controls what operations can be used on them and how those operations behave. gist_geometry_ops_2d 2-dimensional spatial index and is the default for geometry, raster, and topology. It‘s best to just allow the default. In pre-2.0 versions, this was called geometry_ops. If loading data from PostGIS 1.5 or below that explicitly stated the old operator class, you may need to run the legacy_gist.sql packaged with 2.0.2+ which includes the old op name before you can restore this data. gist_geometry_ops_nd n-Dimensional index used for 3D and 4D geometry columns. gist_geography_ops The only and the default class for geography type data. PostGIS comes bundled with several tools for loading and exporting spatial data. There are many other FOSS tools that are commonly used with PostGIS as well. Listed below is a common subset. shp2pgsql Command-line packaged with PostGIS for loading data from ESRI shape files. pgsql2shp Command-line packaged with PostGIS for exporting data to ESRI shape file or DBF. raster2pgsql Command-line tool packaged with PostGIS for loading various formats of raster data. shp2pgsql-gui A graphical tool for both loading and exporting spatial data. Versions prior to 2.0 only supported import. It is packaged with some distributions of PostGIS, for example windows distributions of PostGIS have it packaged. impOSM Another tool for importing OSM data (not packaged with PostGIS). http://imposm.org Newer than osm2pgsql and some say faster but not as many OS supported. OSGeo Live http://live.osgeo.org self-contained Xubuntu (comes in bootable form or as a VMWare, VirtualBox, KVM Virtual machines) that includes PostGIS, MapServer,QGIS, gvSig and other FOSS GIS tools. Great for teaching and experimenting. -g <column> Column name geography or geometry. If there are multiple and this is not specified, will output the first one found. Below are common backup and restore statements. Note: backing up a spatial database is not different from backing up any other database. ST_ColorMap(rast, colormap) Creates 8BUI multiband raster from single band raster. Colormap takes on values such as \"grayscale\", \"pseudocolor\", or a colormap text string that defines mapping. Use this function to \"colorize\" your raster.